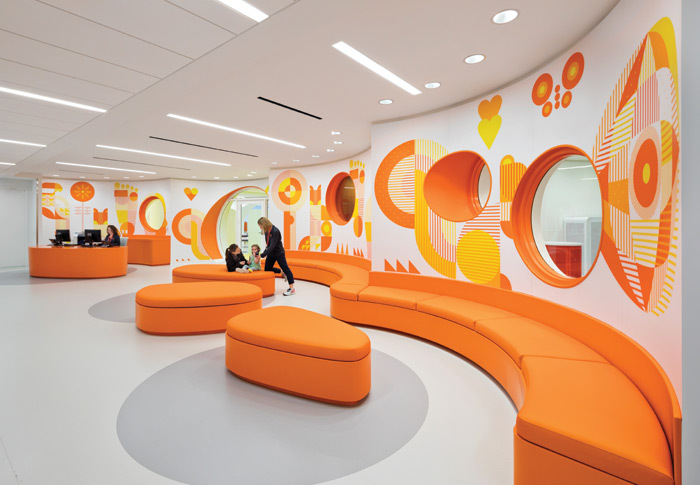 Hospital and clinic design is undergoing immense change as commissioning bodies begin to recognise the inherent value of good design, believes architect Catherine Zeliotis, healthcare leader at international design company Stantec. Despite the pressures on budgets that can promote utilitarian solutions, there is now a recognition that good buildings make sense for environmental, staff retention and patient wellbeing reasons. Around the world, architects involved in healthcare seem to be concentrating on much the same principles – daylight and access to nature, intuitive navigation, human scaling and creating a sense of privacy and personal control in a situation that has the potential to be dehumanising. ‘Architecture has the ability and responsibility to improve people’s lives and nowhere is this more important than in a building dedicated to making people well,’ affirms Ivan Harbour of Rogers Stirk Harbour + Partners, co-architects with Stantec on the recently opened Cancer Centre at Guy’s Hospital. The first two principles – daylight and views of nature – are now almost universally recognised as priorities in healthcare, although it has taken more than 30 years for the biophilic concepts first investigated by Roger Ulrich, professor of architecture at the Centre for Healthcare Building Research in Sweden, to become mainstream. Ulrich proved that patients recovered from surgery faster, experienced reduced stress and were discharged from hospital sooner if they could see the natural landscape from their window. 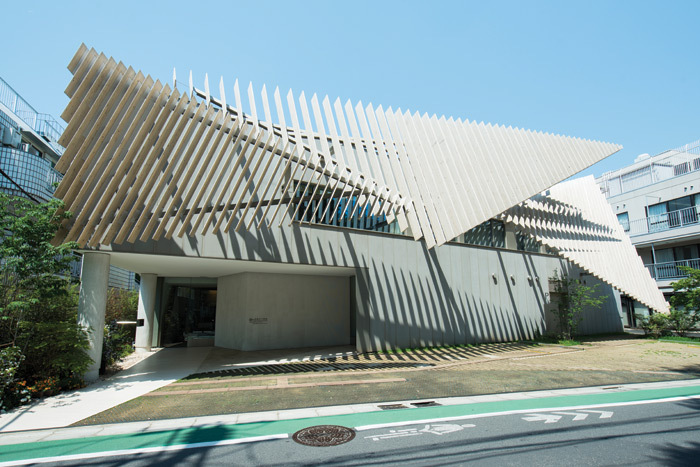 Incorporating views and natural planting into hospital environments is now commonplace – Tokyo-based Kengo Kuma and Associates, for example, has just completed the Seijo Kinoshita obstetrics and gynaecology hospital in Tokyo in which the waiting areas and bedrooms merge almost seamlessly into the landscaped courtyard garden. ‘We designed a green, wooded refuge… eschewing the cold institutional character more typical of hospitals,’ says the practice about what has become known locally as the Green Hospital. 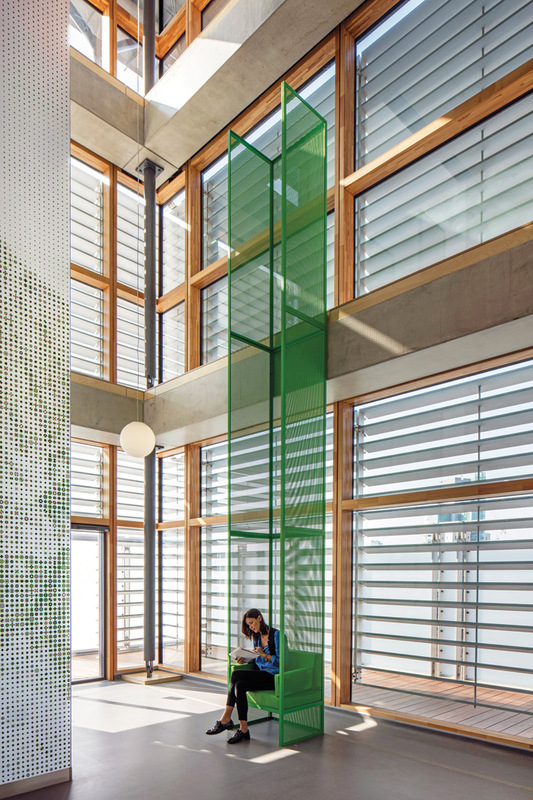 At The Manser Practice’s holistic NGS Macmillan cancer unit at Chesterfield Royal Hospital, patients receiving chemotherapy can gaze out over the Derbyshire countryside, while the whole, uncluttered design is intended to reduce stress. The incorporation of natural features such as daylight and planted courtyards can aid with the second priority of simple navigation, says Catherine Zeliotis. ‘There’s a need to alleviate threshold anxiety; patients coming to hospital are already quite stressed about what’s going to happen so the design needs to have a clarity about the initial approach to the hospital,’ she says. ‘The entrance needs to be on a human scale with clear directions and a welcoming feel so it isn’t overwhelming. People who are already stressed can get lost easily, but if we can get daylight opportunities and links to nature through the patient journey it becomes much easier and more intuitive.’ Using different colours, varied artworks and differently designed courtyards in the building can all help staff to give clear directions and patients to remember where they are. ‘If you have to use a sign that’s really already a defeat,’ she says. 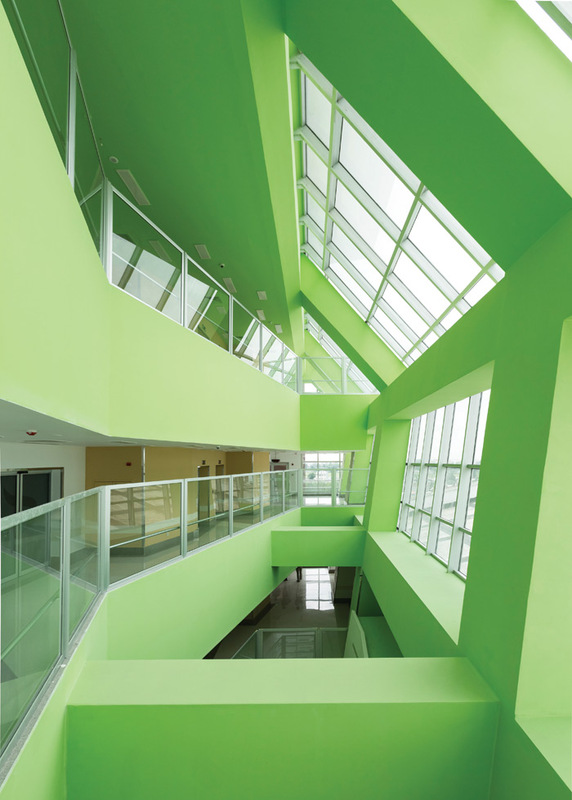 At the Pars hospital, a main transparent atrium links the different parts of the hospital together, while dashes of bold colour help with wayfinding. 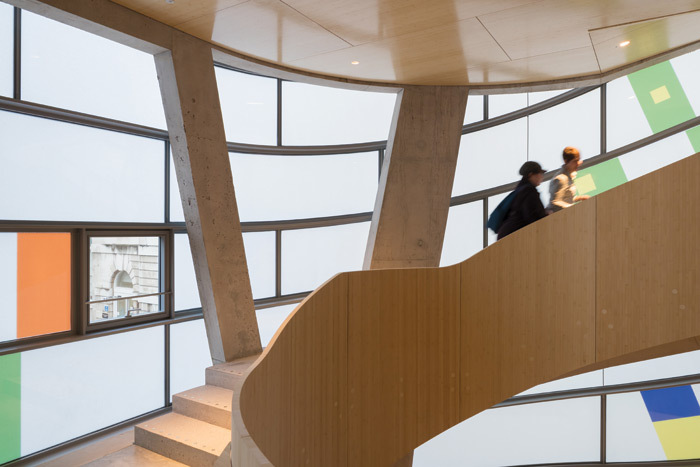 At the new Maggie’s, created by Steven Holl at Barts, the three storeys of the building are linked by an open, curved staircase that leads patients gently through the structure of the building. In most cases, architects are striving to create buildings that, while necessarily large, are never overwhelming. ‘We try to make sure we break down the mass of the hospital into smaller looking units that are on a more domestic scale so people feel more comfortable,’ says Zeliotis. ‘A building that is easy to understand conveys calm and peacefulness,’ adds Shai Weinstein. His firm’s solution at the Maggie’s centre in Oldham was a holistic environment with natural views, wooden finishes and comfortable seating. Others have followed the airport analogy more closely, offering extended retail, educational possibilities and catering to make waiting around less of a burden. Stantec’s design for the Victoria Wing at the Newcastle Royal Victoria Infirmary linked the hospital and adjoining medical campus with a landscaped public street and put a sky-lit multilevel mall through the centre of the hospital, complete with food court and cinema. Not only has the stress of waiting been eased, but as people often visit the location for purely leisure reasons, the threshold stress has been largely removed. At the treatment and recovery stage, architects are also promoting a more patient-centred design. ‘In the UK now, medicine is developing a more collaborative approach,’ notes Zeliotis, ‘so we provide a round table so the patient and clinician can sit next to each other rather than have the doctor on the other side of a big desk.’ She also tries to include facilities for families, including sofa beds with storage underneath so relatives of critically ill patients can easily stay overnight. Environmental controls that can be operated by the patient from bed help give some autonomy, while comfortable patient lounges, bedside entertainment and even colour-changing LED lighting features on the ceiling can relieve the boredom of even the sickest patients.